Please refer to our stock # 605 when inquiring. Especially beautiful 20" ( 51 cm ) French Bebe by Etienne Denamur from first period ....... has pale and fine creamy bisque socket head with early deep modeling , full cheeks and lovely quality of bisque and painting included stunning large blue glass enamel inset eyes . She has fine painted thick dark eyeliner and lushly painted lashes and feathered brows. She has complete generally excellent all perfect condition ..... her pale bisque is free of damage , hairline , repair or chip ..... Original French composition and wooden fully jointed French body with original body finish in also generally excellent condition , only small not disturbing old color problem at her right hand and color refresh under one of her foot sole !! She is wearing original antique childlike pink silk dress and lavish silk bonnet, set of under garment with stocking and French shoes. 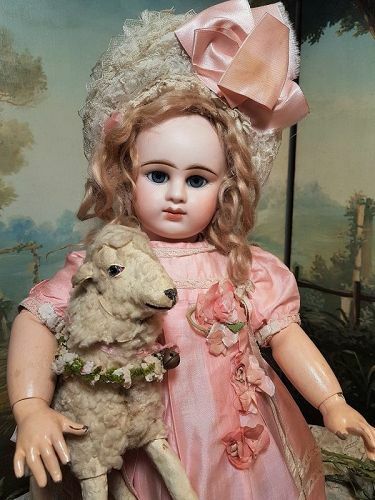 Most beautiful French Bebe with very cute expression of round face with lovely and best quality of deep modeling bisque and finest painting with stunning large blue eyes , original body and with her childlike clothing she is ready to display and a treasure for each collection !!! The little lamb don´t belongs to this doll .... you can find it in another offer in my shop !! Let me know if you have any question or if you need more or special pictures and thank you for your interest on my Doll - Shop ! !